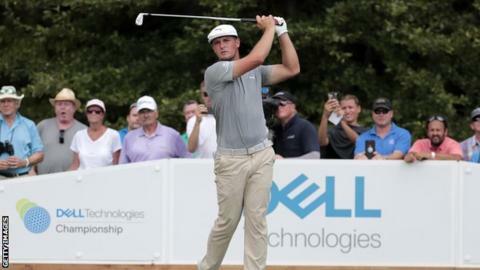 Bryson DeChambeau won his second FedEx Cup play-off event in as many weeks with victory at the Dell Technologies Championship at TPC Boston. The 24-year-old American carded a final-round four-under-par 67 to win by two shots from England's Justin Rose. DeChambeau started the second of four end-of-season events leading the FedEx Cup after winning the Northern Trust. The top 70 in the standings will play in the third event which begins on Thursday in Pennsylvania. Who will make US Ryder Cup team? Perhaps of more importance, DeChambeau's victory looks to have cemented his place in the United States Ryder Cup team as one of four wildcard picks. Eight players have already automatically qualified for the team to face Europe at Le Golf National in Paris, and captain Jim Furyk will name three of his picks at 22:00 BST on Tuesday - the fourth will be named on 10 September. DeChambeau, who has never played in the biennial event, finished ninth on the list, while fourteen-time major winner Tiger Woods is also likely to be included. The former world number one was unsure if he would ever play again after undergoing back surgery in 2017. He was outside of the world's top 1,000 this time last year but has climbed back into the top 30 after finishing joint sixth at The Open in July and second at last month's PGA Championship. Woods ended 11th on the US Ryder Cup rankings list and continued his comeback by finishing joint 24th at in Bsoton. The 42-year-old started the final round just outside the top 10 and was three under for the day after 11, four shots off the lead, before dropping three shots in three holes to finish with a level-par 71. Five-time major winner Phil Mickelson is also hotly tipped to be included for what would be a record 12th Ryder Cup - England's Nick Faldo is the only other player to compete in 11. The left-hander, who was 10th in the US standings, shot his lowest round of the season on Monday, an eight-under-par 63, to finish three ahead of Woods. The 48-year-old said: "Hopefully, that will make it a lot easier for Jim. I'd love to be on that team." DeChambeau's win in Massachusetts makes him the second player - after Vijay Singh in 2008 - to win the first two legs of the FedEx Cup play-offs. It is his fourth win on the PGA Tour in just over one year and he is projected to move to number seven in the world rankings. "It's such an honour to be able to do it so early in my career," he told Sky Sports. "That's something I've been working on doing for a long time and hopefully I can get closer to that number one spot. "If I keep doing my game its going to be tough to beat," he added. Rose's three-under-par 68 saw him take second position, one shot ahead of Australian Cameron Smith. World number one Dustin Johnson, who is second in the FedEx Cup standings, finished in a tie for seventh, five shots off the lead. European Ryder Cup team-mates Rory McIlroy and Tyrrell Hatton finished tied for 12th at 10 under after one-under and two-over final rounds respectively.